Anna Hutson, founder of Avenue. Anna will cover the future of content and social media marketing, inclusive of content format trends and audience expectations, distribution for all stages of the buyer’s journey, paid promotion, live video/live streaming, machine learning and content personalization, and building a content and social team staffed for the needs of in-house teams and for clients in 2018 and beyond. Kevin Getch, founder of Webfor. The future of digital marketing is one of Kevin's favorite topics. He's previously shared his theory on the future of digital back in 2015 where he mentioned it would follow 3 major trends. He called these the 3 P's: Personalized, Predictive & Proactive. His predictions coming true has only served to make his head bigger. Still not as big as Todd's though! Scott Hendison, founder of Search Commander, Inc. Scott has been internet marketing and selling online since before the turn of the century, and plans to answer any questions he can. His primary strengths are organic and technical SEO, WordPress and Facebook Ads, and he has experience pushing the envelope with a wide variety of nefarious online activities that can get your domain banned from Google. Ryan Campbell, Associate Director of Demand Gen at Obility, an agency that specializes in B2B marketing. Ryan believes in the power of digital marketing to drive effective and measurable results. Ryan started his career in internet marketing in 2006 and that’s when he discovered SEMpdx events. His career background and experience is diverse. He’s worked both in house and at an agency, helping small local businesses develop their first digital campaign or managing campaigns spending over $100K monthly to exceed company goals. Introducing our Guest Panelist, Caleb Donegan, VP of Digital at Vacasa. Caleb is an expert in national-to-local paid and organic search, and has led cutting-edge SEO, SEM and analytics initiatives for brands, agencies, and tech companies throughout his 11+ years in the industry. As VP of Digital at Vacasa Caleb manages Vacasa.com’s e-commerce solution and strategy. Moderated by David Mihm, founder of Tidings. David is first and foremost an advocate for sustainable digital marketing techniques for small businesses. In 2012, he sold his former company GetListed.org to Moz, helping over 3 million businesses get better visibility in the local search engines. He’s a co-founder of the Local University conference series, and now runs Tidings. Concerned about future Google algorithm changes sinking your search rankings? Wondering what new tools or products are being released in 2019? Want to get the inside scoop on where digital marketing is headed this year? This is the educational event for you! 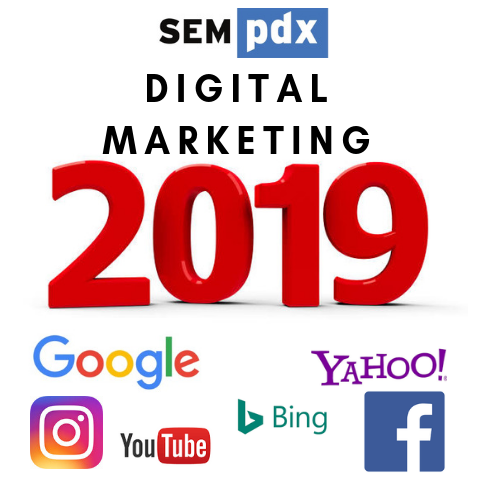 Our expert panel is comprised of digital marketing veterans and members of the SEMpdx Board of Directors. Anna, Kevin, Scott and Ryan will be ready and willing to answer any questions you want to ask. We've also added a guest panelist this year, Caleb Donegan from Vacasa, to bring additional insights to the discussion. Like last year's panel, David Mihm, Local Search guru and founder of email marketing startup Tidings, will be moderating, so you know it's going to be good. Follow the discussion on Twitter at @SEMpdx and contribute by using hashtag #SEMpdx. There is street parking available around the venue ($2.00/hour until 7:00 pm), a pay lot across the street in the Safeway building (enter on NW 14th), and several pay lots 2-3 blocks away, under the 405 freeway. 2 hours of free street parking is available several blocks west of the 405. Streetcar stops are 1 block north or south, and the nearest bus stop is 6 blocks away on NW 14th & Glisan (route 77). And don't forget about Uber and Lyft! Early Bird member tickets start as low as $20! Prices go up on January 3rd, so get ‘em early.